Uninor is going to stop its service next month i.e., January 2013. 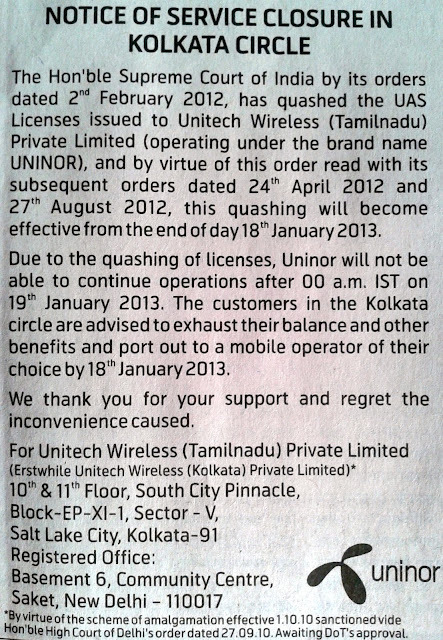 Yes, the cheapest telecom service provider Uninor will no longer be giving its service from January 2013. Uninor Mobile Service provider will stop their services in Kolkata circle, Bengal circle and other circles on 19th January 2013. The service license of Unitech Wireless Private Limited [operating under the brand name Uninor] has been cancelled by the order of Honourable Supreme Court of India. Thus all the Uninor Mobile customers are requested to use up their account balance & other facilities by 18th January 2013 [last date of service]. Uninor customers of Kolkata & Bengal circle will get a sms from Uninor Customer Care soon stating their service cancellation & with the request of using up all account balance by the last date i.e., 18th January 2013. The SMS sent by Uninor to the mobile users will convey this message or something related to this – “Since the Supreme Court cancelled Uninor License. We cannot provide services in Kolkata after 18th January 2013. Use your balance & port out by then. For help call 121”. This message clearly states that Uninor is closing down in Kolkata & Bengal circle and the Uninor numbers won’t work from 00:00 IST 19th January 2013. Barasat Uninor Mobile Store in Kolkata is located near to Barasat Colony More and Sarojini Palli on Barasat-Barrackpore Road. One of the best Mobile Service Providers Uninor has many authorized Uninor Stores in Kolkata to serve better service to the Uninor Mobile phone Customers of Kolkata. Uninor Mobile Store Barasat, Kolkata offers all kinds of services related to Uninor Mobile service in Prepaid, Postpaid and solving complaints. Uninor Mobile Store Barasat Kolkata also accept Uninor Postpaid Mobile Bills from the customers who are seeking Uninor Postpaid Bill Collection Centres near by Barrackpore, Madhyamgram, Sodepur, Duttapukur, Barasat area of North Kolkata. Barasat Uninor Mobile Store Kolkata Address: 15, Barrackpore Road, Sarojini Palli, Helabottola, Colony More, Barasat, North Kolkata-124. Barasat Kolkata Uninor Store Phone Contact Number: 9062200116. Uninor Store of Barasat, Kolkata also accepts Anandabazar Patrika Matrimonial Advertisements in the authorized Anandabazar Patrika Drop Box located inside Uninor Store, Barasat Kolkata. Shibpur Uninor Mobile Store in Howrah is located on Shibpur College Road. One of the best Mobile Service Providers Uninor has many authorized Uninor Stores in Howrah to serve better service to the Uninor Mobile phone Customers of Howrah. Uninor Mobile Store Shibpur, Howrah offers all kinds of services related to Uninor Mobile service in Prepaid, Postpaid and solving complaints. Uninor Mobile Store Shibpur Howrah also accept Uninor Postpaid Mobile Bills from the customers who are seeking Uninor Postpaid Bill Collection Centres near by Howrah, Shibpur area of Howrah. Shibpur Uninor Mobile Store Howrah Address: College Road, Shibpur, Howrah-3. Shibpur Howrah Uninor Store Phone Contact Number: 9062200124. Uninor Store of Shibpur, Howrah also accepts Anandabazar Patrika Matrimonial Advertisements in the authorized Anandabazar Patrika Drop Box located inside Uninor Store, Shibpur Howrah. Narkeldanga Uninor Mobile Store in Kolkata is located on Maulana Abul Kalam Sarani of Narkeldanga. One of the best Mobile Service Providers Uninor has many authorized Uninor Stores in Kolkata to serve better service to the Uninor Mobile phone Customers of Kolkata. Uninor Mobile Store Narkeldanga, Kolkata offers all kinds of services related to Uninor Mobile service in Prepaid, Postpaid and solving complaints. Uninor Mobile Store Narkeldanga Kolkata also accept Uninor Postpaid Mobile Bills from the customers who are seeking Uninor Postpaid Bill Collection Centres near by Maniktala, Kankurgachi, Salt Lake, Narkeldanga area of Kolkata. Narkeldanga Uninor Mobile Store Kolkata Address: 8/2, Moulana Abul Kalam Azad Sarani, Narkeldanga, Kolkata-11. Narkeldanga Kolkata Uninor Store Phone Contact Number: 9062200112. Uninor Store of Narkeldanga, Kolkata also accepts Anandabazar Patrika Matrimonial Advertisements in the authorized Anandabazar Patrika Drop Box located inside Uninor Store, Narkeldanga Kolkata. G.T.Road Uninor Mobile Store in Howrah is located on Howrah G.T. Road near to Shibpur. One of the best Mobile Service Providers Uninor has many authorized Uninor Stores in Howrah to serve better service to the Uninor Mobile phone Customers of Howrah. Uninor Mobile Store G.T.Road, Howrah offers all kinds of services related to Uninor Mobile service in Prepaid, Postpaid and solving complaints. Uninor Mobile Store G.T.Road Howrah also accept Uninor Postpaid Mobile Bills from the customers who are seeking Uninor Postpaid Bill Collection Centres near by Shibpur BE College, Santragachi, G.T.Road area of Howrah. G.T.Road Uninor Mobile Store Howrah Address: Ground Floor, BL-E, Shop No.5, 493/C/A G.T. Road (South), Shibpur, Howrah-2. G.T.Road Howrah Uninor Store Phone Contact Number: 9062200075. Uninor Store of G.T.Road, Howrah also accepts Anandabazar Patrika Matrimonial Advertisements in the authorized Anandabazar Patrika Drop Box located inside Uninor Store, G.T.Road Howrah. Ajaynagar Uninor Mobile Store in Kolkata is located near to Survey Park of Ajaynagar. One of the best Mobile Service Providers Uninor has many authorized Uninor Stores in Kolkata to serve better service to the Uninor Mobile phone Customers of Kolkata. Uninor Mobile Store Ajaynagar, Kolkata offers all kinds of services related to Uninor Mobile service in Prepaid, Postpaid and solving complaints. Uninor Mobile Store Ajaynagar Kolkata also accept Uninor Postpaid Mobile Bills from the customers who are seeking Uninor Postpaid Bill Collection Centres near by Survey Park, Bansdroni, Ajaynagar area of South Kolkata. Ajaynagar Uninor Mobile Store Kolkata Address: C-231, Survey Park, Ajaynagar, Kolkata-75. Ajaynagar Kolkata Uninor Store Phone Contact Number: 9062200126. Uninor Store of Ajaynagar, Kolkata also accepts Anandabazar Patrika Matrimonial Advertisements in the authorized Anandabazar Patrika Drop Box located inside Uninor Store, Ajaynagar Kolkata. Srirampur Uninor Mobile Store in Hooghly is located near to Battala more on G.T. Road of Serampore in Hooghly district of Bengal. One of the best Mobile Service Providers Uninor has many authorized Uninor Stores in Hooghly to serve better service to the Uninor Mobile phone Customers of Hooghly. Uninor Mobile Store Srirampur, Hooghly offers all kinds of services related to Uninor Mobile service in Prepaid, Postpaid and solving complaints. Uninor Mobile Store Srirampur Hooghly also accept Uninor Postpaid Mobile Bills from the customers who are seeking Uninor Postpaid Bill Collection Centres near by Konnagar, Rishra, Sheoraphuli, Srirampur area of Hooghly. Srirampur Uninor Mobile Store Hooghly Address: 78A, G.T. Road, Battala, Srirampur, Hooghly-712201. Srirampur Hooghly Uninor Store Phone Contact Number: 9062200110. Uninor Store of Srirampur, Hooghly also accepts Anandabazar Patrika Matrimonial Advertisements in the authorized Anandabazar Patrika Drop Box located inside Uninor Store, Srirampur Hooghly. Behala Uninor Mobile Store in Kolkata is located near to Behala Ajanta Cinema Hall on Diamond Harbor Road at Behala, South Kolkata. One of the best Mobile Service Providers Uninor has many authorized Uninor Stores in Kolkata to serve better service to the Uninor Mobile phone Customers of Kolkata. Uninor Mobile Store Behala, Kolkata offers all kinds of services related to Uninor Mobile service in Prepaid, Postpaid and solving complaints. Uninor Mobile Store Behala Kolkata also accept Uninor Postpaid Mobile Bills from the customers who are seeking Uninor Postpaid Bill Collection Centres near by Alipur, Parnasree, Behala area of South Kolkata. Behala Uninor Mobile Store Kolkata Address: 87, Diamond Harbor Road, Kolkata-34. Behala Kolkata Uninor Store Phone Contact Number: 9062200090. Uninor Store of Behala, Kolkata also accepts Anandabazar Patrika Matrimonial Advertisements in the authorized Anandabazar Patrika Drop Box located inside Uninor Store, Behala Kolkata. Elgin Road Uninor Mobile Store in Kolkata is located on Ashutosh Road of South Kolkata. One of the best Mobile Service Providers Uninor has many authorized Uninor Stores in Kolkata to serve better service to the Uninor Mobile phone Customers of Kolkata. Uninor Mobile Store Elgin Road, Kolkata offers all kinds of services related to Uninor Mobile service in Prepaid, Postpaid and solving complaints. Uninor Mobile Store Elgin Road Kolkata also accept Uninor Postpaid Mobile Bills from the customers who are seeking Uninor Postpaid Bill Collection Centres near by Bhawanipur, Minto Park, Elgin Road area of South Kolkata. Elgin Road Uninor Mobile Store Kolkata Address: 4B, Ashutosh Road, Elgin, Kolkata-20. Elgin Road Kolkata Uninor Store Phone Contact Number: 9062200092. Uninor Store of Elgin Road, Kolkata also accepts Anandabazar Patrika Matrimonial Advertisements in the authorized Anandabazar Patrika Drop Box located inside Uninor Store, Elgin Road Kolkata. B.B.D. Bag Uninor Mobile Store in Kolkata is located at Dalhousie, which is know as Office Para of Kolkata. One of the best Mobile Service Providers Uninor has many authorized Uninor Stores in Kolkata to serve better service to the Uninor Customers of Kolkata. Uninor Mobile Store B.B.D. Bag, Kolkata offers all kinds of services related to Uninor Mobile service in Prepaid, Postpaid and solving complaints. Uninor Mobile Store B.B.D. Bag Kolkata also accept Uninor Postpaid Mobile Bills from the customers who are seeking Uninor Postpaid Bill Collection Centres near by Dalhousie, Lal Bazar, B.B.D. Bag area of Kolkata. B.B.D. Bag Uninor Mobile Store Kolkata Address: 64A, Hemanta Basu Sarani, Dalhousie, Kolkata-1. B.B.D. Bag Kolkata Uninor Store Phone Contact Number: 9062200072. Uninor Store of B.B.D. Bag, Kolkata also accepts Anandabazar Patrika Matrimonial Advertisements in the authorized Anandabazar Patrika Drop Box located inside Uninor Store, B.B.D. Bag Kolkata. M.G. Road Uninor Mobile Store in Kolkata is located on C.R. Avenue (Central Avenue). One of the best Mobile Service Providers Uninor has many authorized Uninor Stores in Kolkata to serve better service to the Uninor Customers of Kolkata. Uninor Mobile Store M.G. Road, Kolkata offers all kinds of services related to Uninor Mobile service in Prepaid, Postpaid and solving complaints. Uninor Mobile Store M.G. Road Kolkata also accept Uninor Postpaid Mobile Bills from the customers who are seeking Uninor Postpaid Bill Collection Centres near by Girish Park, Sonagachi, Md Ali Park, Kumortully, M.G. Road area of Kolkata. M.G. Road Uninor Mobile Store Kolkata Address: 131, Central Avenue, M.G. Road, Kolkata-73. M.G. Road Kolkata Uninor Store Phone Contact Number: 9062200094. Uninor Store of M.G. Road, Kolkata also accepts Anandabazar Patrika Matrimonial Advertisements in the authorized Anandabazar Patrika Drop Box located inside Uninor Store, M.G. Road Kolkata.